In L.A. Halloween is the earliest we start to see Fall. For me it is also when I start looking to gather my family and friends together. There is no better way to get people together than a warm cup of soup and a comfort sandwich. So when the kids start collecting candy, I start making soups. A soup and sandwich combo is perfect because it gives me an excuse to get up from the table and not be the only one in the kitchen. I love the idea of inviting everyone into the kitchen to ladle up a bowl of warm tomato soup and help themselves to my Panini bar, to make their own sandwich. I found and interesting tomato soup mash up with French Onion Soup. It sounded great but had a lot of steps. Unless, it’s a holiday that is not how I want to spend my time in the Fall. I took the lead from Poole’s Diner in North Carolina and made it my own. The best is caramelized onions and the sweetness they add. In addition to putting out a beautiful selection of meats, cheeses, breads and toppings, for the Panini bar, I also make these Grilled Cheese Roll-ups. They’re super easy and the kids love to be able to grab them and run out the door to Trick or Treat. Don’t tell the kids but I actually put a little bit of Dijon on the bread before it cooks. I hope you all have a fabulous Fall season and a scary Halloween. 2 - 2 1/2 pounds tomatoes I like to mix different sizes and colors to get a richer tomato taste. 2 pounds onions (I use sweet and yellow) halved and sliced thin. Toss together tomatoes, garlic, olive oil, kosher salt and pepper. Roast for 20 - 30 minutes. Remove from oven and add to soup pot with chicken stock, bay leaves and butter. Bring to a boil then reduce heat and simmer for 15 - 20 minutes. While soup is cooking: Heat the vegetable oil in a heavy skillet, over medium heat. Add onions and 2 tsp. salt. Turn heat to high and stir for 1 minute to coat onions evenly with salt and oil. Reduce heat to medium/low and cover pan. Cook covered for 20 minutes. Uncover and continue to stir and cook until onions are thick and a deep brown color. Set aside. Remove bay leaves. Use immersion blender and blend to desired consistency. I like mine a little rustic. Add the caramelized onions and stir to incorporate and heat onions, if they've cooled. At this point you can add cream, if using. Stack 2 baguette slices in each bowl, with 1 T. of cheese between each layer and on top. Ladle the hot soup around the bread. Place bowls under the broiler and cook for 2 - 3 minutes until the cheese is bubbly and browned. This is easier if you put the bowls on a sheet pan. Use a rolling pin, to roll slices of bread to 1/4" thickness. Spread each slice with a tiny bit of Dijon mustard, optional. Place 1 lice of cheese on each bread and roll tightly. Melt 2 T. of butter in a large fry pan over high heat. Add roll-up to pan and cook until all sides are golden brown and cheese is melted. You may have to do a few at a time and add more butter if needed. As a young mother, MANY years ago, I was very idealistic. My children were not going to eat chocolate, too early. High fructose corn syrup would never pass their lips and they would never have frozen or processed foods. Ha! Last summer we vacationed in Lake Tahoe, and were concentrating on the simpler pleasures. We hiked and spent days on the lake. Our nighttime activities were nothing more than dinner out and a movie in the hotel room. One night, while we were waiting for our table, at dinner, my kids and husband were playing beanbag toss. I must have been in a dreamlike state, when I had a vision of those little girls and the meals I use to make for them. I don’t think there is a kid out there that doesn’t like chicken tenders or nuggets. In an effort to get my kids to be happy campers at dinner I developed my own recipe for chicken nuggets. It was a hit! I always served them with whatever fresh fruit was in season and some sort of potato. I admit that I was too lazy to make my own French fries so I often used a wholesome frozen variety. As we get back into the busy days of fall, I hope you and your family will take a moment to slow down and enjoy a simple pleasure like homemade chicken nuggets. Oh and we are planning our next Lake vacation. In a large ziplock bag combine flour, parsley, poultry seasoning, salt & pepper. Add chicken pieces to bag a few at a time. Shake to coat and then set aside. In a shallow bowl stir milk and egg. Put crushed crackers in another bowl. Dip floured chicken pieces in egg mixture then crackers to coat well. Then place on baking sheet, in a single layer. My kids love these with ranch dressing homemade or not. Last summer I got to spend many days cooking, teaching and hanging out with one of my favorite kids. The best part is it was all under the guise of cooking school or Camp Culinary, as I called it. Noah is a freckle-faced 11 year old boy that you will usually find in some sort of team t-shirt and matching everything else. Sports are Noah’s thing. Cooking is his other thing. He asked for a cooking play set for his 3rd birthday and even though it wasn’t with me, this summer he continued his culinary education with more classes. Mom gave me carte blanche. Noah gave me challenges that upped my game. I suggested we decorate cupcakes and make macaroni and cheese and maybe pasta al la checca. He said “What about Mother Sauces?”. This kid is amazing. We started with mayonnaise, hollandaise and veloute. Did I mention he made me sharpen my skills? It is very hot here in Southern California and my mayonnaise got way too thin, too fast and my hollandaise got overcooked. He loved it, not because I messed up and he could giggle (which he did), but because it gave him another opportunity to learn. We remade both and they were great! Noah found heaven when dipping a piece of broccoli in the hollandaise, complete with eye roll and tummy rub. Our first field trip took us to Grand Central Market in Downtown Los Angeles. Noah had been to L.A.’s famed Farmer’s Market and his local farmer’s markets but never to Grand Central Market. The child that sat in my backseat peppered me with questions like he was on his way to Disneyland. How long will it take us to get there? What stand would we go to first? Did I think he would be able to hold a butcher’s cleaver? The questions continued the whole way. I don’t even think he noticed the traffic we were in. I told him our first visit would be to Bel Campo Meats. I was so pleased at the time each of the vendors took to talk to my young charge and teach him. As promised, first stop was Bel Campo Meats. The butcher took the time to show Noah his meat cleaver and talk about the ways you can cut meat. Did you know that Japan has 200 MORE cuts of the same cow than America? We cut our meat much bigger and have a lot more waste. We learned that cuts, such as the Hangar, used to be used in ground meat or hot dogs. This is because there is only ONE Hangar on each cow. Often it can be cut into two portions but because it is not the tenderest cut it didn’t use to be so popular. The American palette has developed and now we demand flavor as much as the tenderness, so cuts like the Hangar, Flap and Skirt are becoming a lot more popular. After learning all about the different cuts, we decided on a Bavette Steak. After the butcher, we learned about seven different kinds of mole and the differences between double cream, triple cream and hard cheeses. We ordered noodles for lunch at the Chinese place and learned that meant soup! We went to the candy stand and the juice bar. Each vendor was another ride, without the long lines. By the time we got back in the car, we were both exhausted but so satisfied. Before we ever left the parking garage, my little Noah was asleep. It really was a day at Disneyland for him. He was excited to get home and share his experiences and couldn’t wait for our next culinary adventure. It was truly one of my most memorable summer experiences. Here is a great way to prepare Bavette Steak. If you can’t find Bavette you can use skirt or flap steak too. I love romesco sauce! It's bread and almonds and deliciousness! It also happens to be super easy to make. Heat a non-stick pan (I like to use a cast iron skillet) over medium high heat and add 1 T. oil then add onion. Cook until browned. Transfer to a food processor, but don't process yet. Return same pan to heat and add another T. oil to pan. Toast bread and almonds until just golden. Watch carefully. When ready, add to food processor. Add roasted red peppers, water, vinegar, 1/4 tsp. salt and red pepper flakes to processor and pulse until well combined. With processor running add 1 T. olive oil, through top and blend until smooth. Season the steaks with t teaspoon salt and some fresh ground pepper. Reheat your pan over a medium high heat and add the last T. of olive oil. Cook steaks until they are brown on the bottom, about 4 minutes. Flip steaks, reduce heat and continue cooking until desired doneness. A thermometer inserted that reads 130°, will be medium rare after resting. This should take about 12 minutes. Let cook an additional 4-8 minutes for medium to medium well. Let meat rest, covers with foil, on cutting board, for 10 minutes. Slice very thinly against the grain and serve with Romesco sauce drizzled over it or on the side. On December 14, 2014, the United States and Cuba started the process of resuming diplomatic relations. Since then I have been unable to squelch my curiosity about all things Cuban, but especially food. I was intrigued to find that many Cuban dishes have their roots in the Sephardic Jewish population. Ropa Vieja, a popular dish can even be made with a brisket cut of meat. Since I am Jewish I think of it as Cuban Shabbat dinner. My favorite movie is The Godfather movie. You can find me on any Saturday looking to see if it is showing on any one of hundreds of TV channels. Cuba has a large role in Godfather II. That is where Michael went to meet with Hyman Roth and other important dignitaries to plan their business takeover. I wonder if the meal Mr. Roth was serving was his Shabbat in Cuba. That was my first look at the fascinating brightly colored homes and the well-preserved, vintage, American cars that make up Havana. My first taste of Cuban cuisine came from the restaurant Versailles. I live in Los Angeles and like most cities in the US that have any Cuban population; we have a few Versailles’. They serve a wide variety of Cuban food with a, slightly, American flair. Here in LA it might describes as the ‘gringo” version. The Ropa Vieja, below, is based on their recipe. Travel companies are gearing up for the first tours to Cuba, airlines are asking for gate space and Americans are lined up to get their visas. As we wait for all this to happen, I thought it would be fun to give you a Cuban food primer, in your own home. I am making my own experience more authentic, by turning up the humidifier! Havana Harry’s, is a popular Miami restaurant. They serve all things Cuban. While Vaca Frita is typically a beef dish, they do a chicken version that is out of this world. When I first looked down at the plate I felt betrayed. Was I in little Havana or Israel? Vaca Frita looks very much like Shwarma meat served on the plate and accompanied by pita. The real secret to a great Vaca Frita is the “mojo”. This iconic citrus marinade is used in so many aspects of Cuban cooking. It can be made with or without oil. The oil becomes crucial when you are cooking meats, such as chicken and fish that have a lower fat content. Every cook has their own version of mojo, but the basics stay the same. Mojo is usually made with bitter Seville orange juice. However, it can sometimes be difficult to find in big American grocery stores. I chose Nelly’s Key Lime Juice, sweet orange juice and lemon juice to try and get the balance of sweet and bitter. Another option is tangerine juice or even pink grapefruit juice. It wouldn’t be Shabbat without dessert and as a matter of fact we recently celebrated Purim. I am including a recipe for a guava cream cheese pastry. My version is a cross between hamantaschen and sopapilla. Guava paste is very sweet, and so is the Cuban coffee you will serve with it. Cafetcito by definition is little coffee so a little goes a long way when serving dessert, too. There are as many opinions on how to make “cafecito” as there are Cubans. There is a Cuban blend of espresso and you can make it in a Mokka (an espresso pot). But you can also use a good Columbian or French roast. You can also boil it on the stove. Some stir their sugar in halfway through the brew process and some make frothy mix of sugar and coffee to stir in after the coffee is brewed. My suggestion is to start with www.3guysfrommiami.com. They have a good but simple version. Just like the mojo, you will find your own personal style. All that’s left to do now is put on some Buena Vista Social Club, start dancing around your kitchen and cook! Place Chicken and bay leaf in a large pot and cover with chicken stock. You can add parsley or cilantro stems, even hearts of celery. Add whatever you have on hand to boost flavor. Bring to a boil and start skimming off foam from surface. Reduce heat and simmer for 45 minutes, or until meat falls off the bone. Remove chicken and let cool, so it can be handled. Let the extra stock cool and then freeze or use immediately. Its a nice start to soups and sauces. remove chicken from bone and shred. Set aside. Heat 2 Tablespoons of the oil in a heavy skillet and saute the roasted garlic. Add in juices, ground pepper, oregano and cumin. Reduce heat and whisk until heated through. This is your mojo. Pour into a bowl and keep warm. In the same skillet heat remaining oil and saute chicken with sliced onions until the onions are tender. Stir in remaining garlic and cook until meat is crisp and browned. Season with salt & pepper. 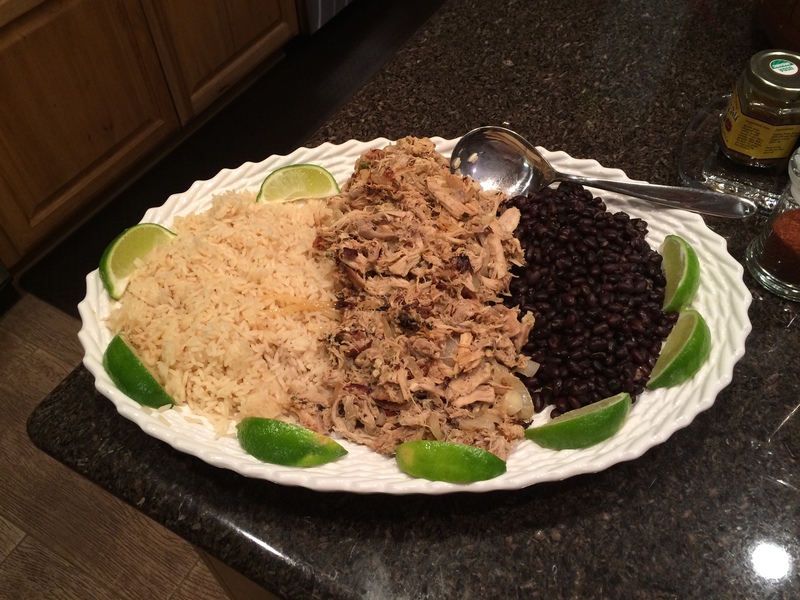 Transfer to a heated platter and serve with white rice and black beans. Garnish with fresh limes. Add all ingredients to a slow cooker. Add just enough water to cover steak. Set cooker to low heat and cook for 6-8 hours until meat comes apart with fork. Shred meat and set aside. Heat olive oil in a large skillet. Transfer peppers and onion from slow cooker to skillet, reserve juice. Add tomato paste, tomato sauce and beef broth. Add shredded beef to tomato mixture and cook for another 20 minutes, stir occasionally. Stir some of the reserved juice into cooked white rice and serve. On a cutting board use a sharp knife to cut 4-6 squares from each sheet of pastry and brush each lightly with egg wash.
Spoon 1 tablespoon each of guava and cream cheese onto squares, slightly off center. Fold square in half forming a triangle and press edges together. Crimp edges with fork and brush tops with more egg wash. Sprinkle with sugar. Arrange pastries on a parchment lined baking sheet and chill in freezer for 20 minutes. Bake until golden and puffed, about 15 minutes. I like to rotate at least once during baking.